In a fundraising environment where thousands of worthy charities are clamoring for the attention and donations of relatively few people willing to give, it takes something big and unusual to get noticed. That’s exactly what Suffolk native Corey Wittersheim did on June 5-6, when he rode 263 miles to raise money for the National MS Society, which is a cause close to his heart because his mother has multiple sclerosis. He has participated in a 100-mile bike ride in past years. But this year he really upped the ante. 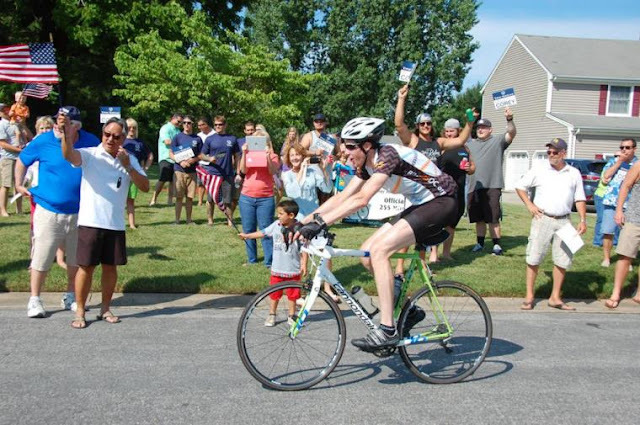 He decided to cycle 255 miles from his home in Fairfax to his parents’ home in Suffolk. Thanks to a detour and a wrong turn, he even added eight miles to that total. But what he added to his fundraising total turned out to be even more impressive. After initially hoping to raise about $10,000, he wound up with a $25,000 total — and rising. According to the National Multiple Sclerosis Society, the cause of this devastating disease is still unknown. Scientists believe the disease might be triggered by environmental factors in a person who is genetically predisposed to it. The disease affects the central nervous system, with the immune system attacking nerve fibers and their insulating tissue, destroying it and producing a wide variety of symptoms, which can include fatigue, walking difficulties, vision problems, dizziness, weakness, bladder and bowel problems, cognitive changes, pain, emotional changes, speech problems, breathing problems, hearing loss and more. It is thought to affect more than 2.3 million people worldwide. It is much more common in women than in men. The average person in the United States has about a one in 750 chance of developing MS, but the risk is higher for people with a close relative who has MS. There is no actual diagnostic test for MS, which makes it difficult for people experiencing such troublesome symptoms to get an answer and get treatment for it, which compounds their hardship. That’s why research into what causes multiple sclerosis, how to diagnose it, how to treat it and, ultimately, how to prevent and cure it, is so important. We congratulate Corey Wittersheim not only for an incredible feat of physical endurance but also for using his skill for a good cause.